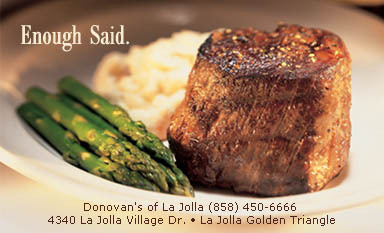 Donovan's Steak & Chop HouseUSDA Prime Beef is the star attraction at Donovan's. The finest steak in San Diego. Try the Prime Rib which is served every Friday. The 24 ounce serving is simply mouth-watering. Best lamb chops in the world. The Seafood Tower will blow you away. Outside cigar patio lounge is open for your enjoyment. Rainwaters On KettnerRainwater's on Kettner features prime, midwestern, cornfed aged beef, fresh seafood from around the world, plus veal, lamb and pork chops. Ruth's Chris SteakhouseSpecialty Steaks. Richly marbled U.S.D.A. Prime and other premium cuts. In addition to steak, the menu includes select fresh seafood and other meat entrees. A variety of fresh-cooked vegetables, including seven kinds of potatoes, salads with dressings made fresh daily, and homemade desserts. Morton's Morton's is famous for its animated signature tableside menu presentation: steaks, whole Maine lobsters and other main course selections, along with fresh vegetables, are presented on a cart rolled to your table, where the server displays and describes each menu item in appetizing and entertaining detail. EPAZOTE - Oceanview Steakhouse Del MarGuests are invited to "pick their passion" from a mouthwatering menu of traditional fine cuts of steak daily for lunch and dinner.